Door attendants handed out earplugs to every concertgoer entering Montreal's Société des Arts Technologiques on Thursday evening (September 21) — and with good reason. 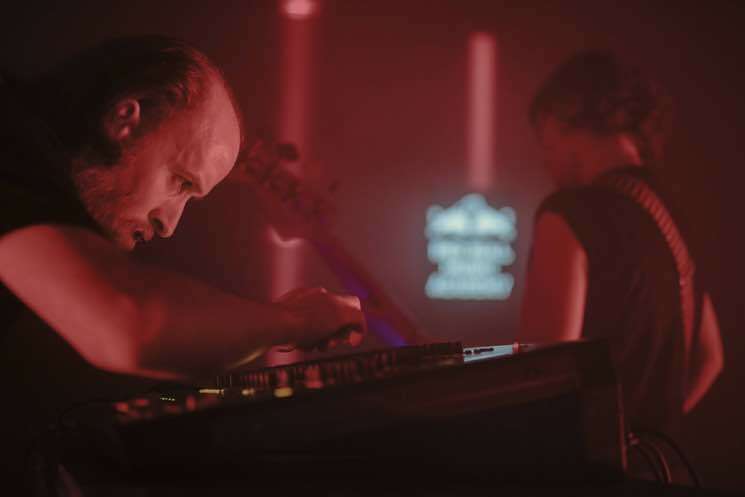 The first of four Red Bull Music Academy showcases set for this weekend, Temple Damné explored various genres of experimental noise and drone music. RBMA didn't just offer a mind-bending musical program, they also delivered unique atmosphere. The concrete cube that is the S.A.T. was completely filled with fog, and almost exclusively illuminated by small overhead spots. First to perform was Dopethrone, a staple of Montreal's metal scene from the Hochelaga neighbourhood. Hailed by their share of head-banging fans, the band offered an entertaining set. Despite the more serious than usual setting, the band didn't try to smooth out any edges. In between slow-tempo, heavy songs, they cracked jokes, asked fans for beers and did an impressive Rick And Morty impression. Metal easily could have been overlooked in the Academy's array of noise music, but their selection of a genuine metal band that was able to blend with other, more obvious experimental acts spoke to the event's dedication to presenting a wide range of acts. Up next, Pan Daijing offered a suite filled with gritty synthetic noise and doomsday-ready drones. All the way from Berlin, the artist delivered filtered loops punctuated by eerie vocals and spoken-word chants. As her set progressed, the volume of the bass rose through RBMA's characteristically potent subwoofers. By the end of her performance, the music was being felt more than heard. Low synth notes pulsated through the bodies of the crowd members, as if to test the limits of what their physical bodies could sustain. As the music faded, the crowd cheered ecstatically. Blending metal and ambient influences, Toronto dreamsludge duo Nadja took the stage next. Aidan Baker played guitar, bent over a soundboard to control various sonic elements, while bassist Leah Buckareff played with her back to the crowd. Slowly building a hypnotic soundscape, they filled the room with dense electric tones and evolving drones. Cascading drum patterns slowly emerged from the static, escalating into distorted, abrasive noise. Through their rich performance piece, the duo managed to evoke both the syncopated repetitions of industrial machines and the oneiric qualities of an imaginary landscape. As a counterpoint to Nadja's set, Âmes Sanglantes offered a tightly packed 20-minute performance. Using digital synth sounds, the musician deconstructed EDM codes to retain only the raw screeching tones and drastic dynamic shifts that the genre is famous for. Alone behind a synth and some pieces of gear, Sanglantes proved himself a wizard, building tension to a terrifying climax, and giving the audience a final, fascinating chance to experience the varied nuances of experimental music. Nadja Explore Director Wong Kar-wai for Wist Rec.